- -The M220T Ethernet Remote I/O Module is an industrial class, isolated designed, high reliability, high stability and high precision data acquisition module, embedded 32-Bit High Performance Microprocessor MCU, Integrated 1 Industrial 10/100M adaptive Ethernet module inside. - -It provides multi I/O, supports standard Modbus TCP, can be intergraded into SCADA, OPC server, and other automation systems, design for working in the harsh industrial application environment, widely used in a variety of industrial automation, security monitoring system, automatically measurement and control system. - -Provides a RS485 interface, through the RS485 bus, it can cascade Modbus RTU I/O devices or Modbus RTU meters, e.g. : a variety of digital input or digital outputs, analog inputs or outputs, thermal resistance IO module combination, save costs. - -At the same time it has register mapping function, the cascade Modbus RTU I/O data are automatically collected to the mapping memory area, the Modbus TCP Client query without waiting then can get a quick response to meet the industrial timely requirements. - -Provides 4 digital outputs, supports 10Hz~300Khz high speed pulse output or relay outputs. All of the I/O with high sampling frequency and special filtering strategy to ensure it's reliable. 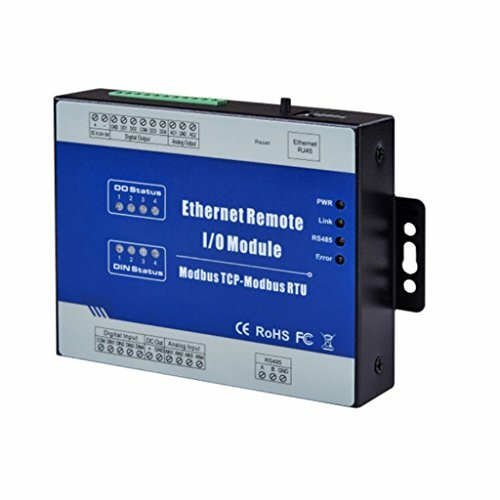 -The M220T Ethernet Remote I/O Module is an industrial class, isolated designed, high reliability, high stability and high precision data acquisition module, embedded 32-Bit High Performance Microprocessor MCU, Integrated 1 Industrial 10/100M adaptive Ethernet module inside. -It provides multi I/O, supports standard Modbus TCP, can be intergraded into SCADA, OPC server, and other automation systems, design for working in the harsh industrial application environment, widely used in a variety of industrial automation, security monitoring system, automatically measurement and control system. -Provides a RS485 interface, through the RS485 bus, it can cascade Modbus RTU I/O devices or Modbus RTU meters, e.g. : a variety of digital input or digital outputs, analog inputs or outputs, thermal resistance IO module combination, save costs. -At the same time it has register mapping function, the cascade Modbus RTU I/O data are automatically collected to the mapping memory area, the Modbus TCP Client query without waiting then can get a quick response to meet the industrial timely requirements. -Provides 4 digital outputs, supports 10Hz~300Khz high speed pulse output or relay outputs. All of the I/O with high sampling frequency and special filtering strategy to ensure it's reliable.